This entry was posted on Tuesday, October 27th, 2009 and is filed under Cycle Karting. You can follow any responses to this entry through RSS 2.0. You can leave a response, or trackback from your own site. Good to see your build is progressing! Nice engine by the way. The low height, due to the lateral petrol tank, can turn out to be a real advantage. The Honda engines are not the most reliable unit for a vehicle. It does a great job as a fixed engine. But on my endurance kart, it proved to lack a proper lubrication system which can handle some G-forces. As a result, I lost 2 engines in one season of only 8 races. I’m still looking for a pair of wheels for now along with some leaf springs. Therefore I’ve decided to start designing the bodywork in the mean time. I’ve chosen a modern interpretation of the Bugatti type 35. Still learning to use the computer for design. The learning curve is rather steep but fun and rewarding nonetheless. I expect this engine will do well in this application. 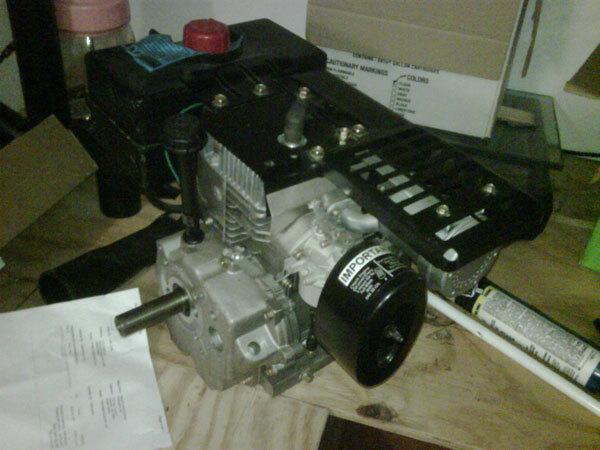 It does have a pressurized oil pump lubrication system, something a lot of the 6hp engines lack. Your CAD work up looks like it will be very helpful. Have you created a cardboard mock up yet? I mentioned this on another post, but I plan to build this cart in two stages, one that I hope to finish nicely in plywood and then the fiberglass stage second. Most build pictures I have seen use a fairly rough plywood box, however I don’t expect to fiberglass until next year so I wanted to make sure my drivable plywood box looks respectable. HA, That was good for a laugh! You most certainly have outgrown your childhood. The cardboard mock up was nice because I could take actual measurements based on how I fit. I then realized that by bumping my width out by two inches from my original dimensions, I will now be able to take my sons for a ride (one at a time of course) beside me, while not exceeding the recommended 40″ max width. (As you can see I’m a novice welder.) I have completed welding on the second frame rail just today, and it’s a bit better (still not great looking, but better penetration, etc.) Will be posting pics tomorrow, probably. I got my buggy-seat springs at amishcorners.com, if you search ebay for buggy seat springs, you’ll find it. I never actually built a cardboard mockup, though I did kind of stack some wood in a kind of mockup, to try to make sure I could fit into the thing. One thing that I did do that was very helpful was to go out to my actual car (a Toyota Celica, not that it matters) and measure the distance from the seat back to the steering wheel when adjusted properly. Then, I took the measurements from my drawings, and adjusted the seat to match those (e.g 25 inches between seat back and steering wheel) and attempted to sit in the car with the seat adjusted to match the drawing. This proved a very valuable experiment as it proved to me that this wasn’t going to work, and I adjusted my drawings to allow a bit more room, and again validated this by adjusting the seat in my car to match the drawings. This is a very easy thing to do, and well worth while. And of course ultimately, I built the body with seat, and was able to try it out, and make sure all was well. Steve, it’s good to see you back at the cycle kart and checking back in here at CylceKarting.com. As far as suspension, I will be addressing it in an upcoming post, but I’m am trying a different suspension. I am going to attempt a single swing arm suspension with a transverse leaf spring. Basically a rudimentary hinged center piece with a single buggy seat spring fixed between both axles. A similar system is actually used on some older Corvettes and Volovo’s. I picked this type of suspension to try because I think it will look really cool when its done. I hope to fabricate the actual axle before posting pix. First of all thanks for the info about the measurements. As you might have seen, it is the main thing I’m dealing with right now. I’ll start measuring my car as well as a reference. My goal is to keep the CycleKart as small as possible (read; as cute as possible). This turns out to be quite a challenge. It does help that the normal size Type 35 is a small car in itself. I’ve just posted a comment on your weblog too. Good idea to keep the proportions in the cute-range. The P3 Alfa of Mr. Mysona started out too close to the original proportions and the wheelbase had to be shortened considerably to get it looking right for a CycleKart. He did such a nice job on the car, but it’s easy to get off at the outset.